There is a lot to explore on this site, so let us give you a hand. Check out our About page to learn about the group, and our History page to learn how we were founded. We host meetings every two weeks. One is a general meeting (check out our events page for more info) and the other is either a workshop or peer review session. You can sign up for the latter here. If you’re looking for help with something, check out our member page so you can find the right person. Or check out descriptions of our different positions. The Bio Department Handbook is good for logistics on classes, qualifying exams, and defending. The CEGSS Handbook is a general survival guide to living in Waco. It covers everything from housing to restaurants to personal care and more! Are you looking for a certain form? Are you soon-to-start or within the first weeks of starting grad school? Read the First Weeks guide. Read the CEGSS handbook for tips and tricks of living in Waco and ways to get involved. Remember that self-care is always important. Take a look at our Health and Wellness Resources. Need health insurance? Read more here. Once you’ve started school, it can be hard to feel successful. Check out some tips here. Feeling like you’re pinching pennies? Snag some extra cash by proctoring here. Do you need help prioritizing your writing? Join a writing group! Read the CEGSS handbook to learn more about life in and around Waco. CEGSS offers workshops on topics helpful to grad student careers, life, and more! 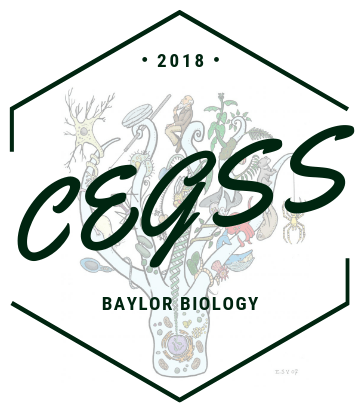 Email CEGSS with any questions or concerns at cegss@baylor.edu or send a message with our contact form. Reserve a time for peer review at one of our meetings. Do you have something you’d like included in the monthly Newsletter? Send it here. Do you have a suggestion for a Speaker for a seminar or event? Let us know! Last Day for Election Nominations! Polling closes at 5pm TODAY (3/29)! URSA Scholars Week is fast approaching and needs your help. They are looking for two judges for each poster. Judging positions are open to Biology Faculty, Staff, and Graduate Students. To volunteer, click the link below to sign up for 3-4 posters. View the video below to learn more about what the Baylor Department of Biology has to offer.